Perhaps roller derby is an untapped market for good beer. If you get past the headline that overstates things a bit, you’ll find a nice long story about Sixpoint making a beer with a new breed of hops throwing off “tobacco” and “lumber” aromas. 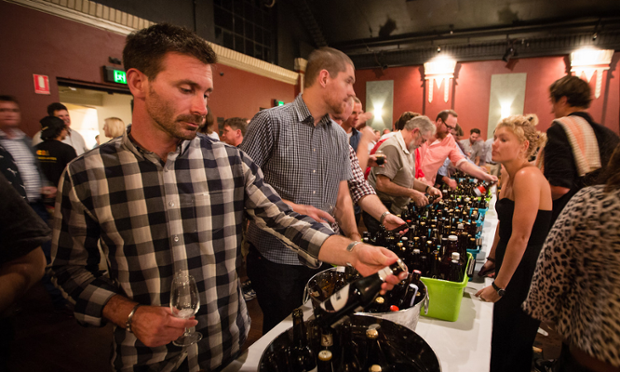 Number 3: This photo from the recent Craft Beer Awards in Sydney. I’d seen this photo a number of times and only thing week did I realise I’m actually in it. Well, my arm is anyway. That’s it, behind the guy in the black and white check shirt standing at the beer table. Here’s why the latest Single Batch won’t be in bottles. Because they might explode. Good enough reason if you ask me. In which I start a short-lived weekly beer recommendation series aimed at the average Joe.